An Islamist group in Indonesia has, in front of a local police commander, sealed off a brand new church, torn down its sign and demanded that the local mayor cancel its permit. The Santa Clara Church in Bekasi, a heavily-populated commuter city to the east of the capital, Jakarta, only opened on 7 March. The Islamic Forum Community (FUI) and other Islamist organisations have been protesting since the church obtained its permit in July 2015, claiming its leaders had used false identity cards to get it. The Asian Human Rights Commission (AHRC) has started an appeal on the church’s behalf, and asked for supporters to send letters to ten top Indonesian leaders, including the President. The AHRC added that it will write a separate letter to the UN Special Rapporteur on Freedom of Religion or Belief. The AHRC noted that local law enforcement agencies failed to intervene on the church’s behalf, leaving the congregants in “fear and uncertainty”. The FUI complained that the church had been built in a community where the majority are Muslims and where Islamic boarding schools also exist. However, the Bekasi mayor refused to annul the church’s permit, saying it had fulfilled all the legal requirements necessary for construction. Indonesia’s Minister of Religion supported the mayor’s decision. “Despite this, law enforcement agencies have failed to protect the Santa Clara Church congregants; in fact, it seems the agencies have no will or policy to enforce the law against vigilantes. As a result, the church congregation lives under pressure and intimidation,” wrote the AHRC in its letter of appeal. The AHRC called upon the local police to “take a strong stance” against the FUI and “ensure that the government guarantees protection to the Santa Clara congregation to practise their religion”. “Furthermore, the government should revise the law on the establishment of worship places without any discrimination among the various religions and beliefs that exist in Indonesia,” the letter concluded. Indonesia is No. 43 on the 2016 Open Doors World Watch List, which ranks the 50 countries where it is most difficult to be a Christian. The current events in Bekasi are all too familiar for Christians in the Jakarta area. In March 2013, the Batak Protestant Church, also in Bekasi, was torn down almost immediately after it had been built. Again, protesting Muslims claimed the church’s leaders had falsified signatures to obtain a permit. Meanwhile, about 70 kilometres away in Bogor – also a commuter city outside Jakarta – another church continues to hold open-air Sunday morning services next to a main road, because its city mayor is afraid to insist that a Supreme Court order is carried out. In April 2010, Bogor’s Taman Yasmin Indonesia Christian Church (GKI Yasmin) was sealed and padlocked by order of the mayor of Bogor and the city government. According to a national paper, he claimed that the previous sub-village head had falsified community signatures and that the church brought trouble with local Muslim neighbours. Later he said that the church should not be built on a street with an Islamic name. GKI Yasmin’s congregation has resorted to conducting services on the pavement in front of their former church for more than two years. 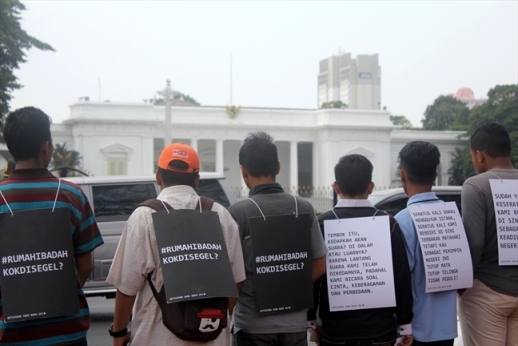 Then they moved to a monthly service in front of the Presidential Palace, alternating with services in other premises. In September last year, the church held its hundredth service outside the palace. A church leader told World Watch Monitor that number has now increased to 115 services.